Auto-Lift is an option recommended for use with Focus "+" based rework packages. After the reflow-zone is finished it automatically raises the component before the start of a cooling cycle. This option makes the removal of components semi-automatic saving operators time. Installation of this option on XK-Series Holders takes few minutes and does not require any tools. XK-1AL, XK-2AL, XK-3AL and XK-4AL Tool holders are XK-1, XK-2, XK-3 and XK-4 Tool Holders with an Auto Lift mechanism built-in. 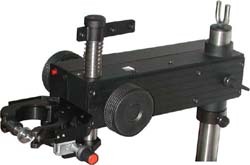 The Auto Lift tool holders are recommended for use with Focus "X" based rework packages. After the reflow-zone is finished it automatically raises the component before the start of a cooling cycle. The Auto Lift makes the removal of components semi-automatic, saving operator's time. Auto Lift can be activated either by a signal from Focus "X", or on demand either by a pushbutton switch or by a foot switch. 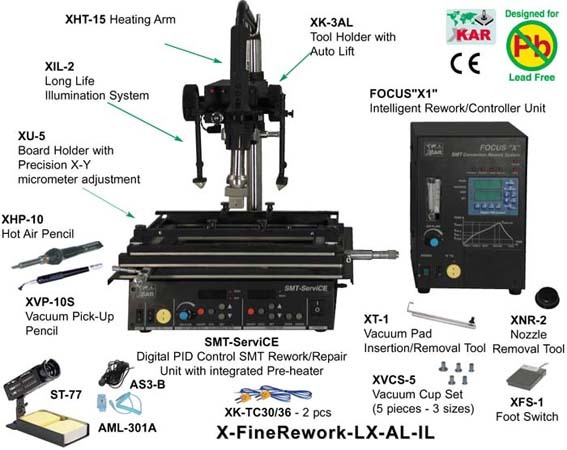 XLK-1 High Column Assembly (including XK-SR Support Ring, XK-W Washer and XK-FS Fastening Screw). X-FineRework-LX-AL-IL shown with Auto Lift XK-3AL.